A transcript of what she said about the press secretary. Comedian Michelle Wolf is being called out by several politicians and journalists for what she said about White House press secretary Sarah Huckabee Sanders at the White House correspondents’ dinner over the weekend. One White House correspondent wrote, "Apology is owed to @PressSec and others grossly insulted ny Michelle Wolf at White House Correspondents Assoc dinner," while another female journalist for the NY Times added, "That @PressSec sat and absorbed intense criticism of her physical appearance, her job performance, and so forth, instead of walking out, on national television, was impressive." 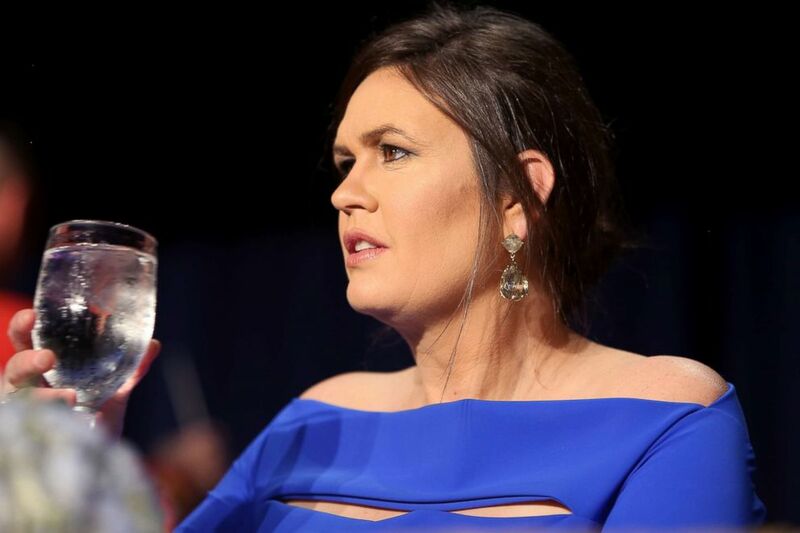 (asos Katopodis/Getty Images) Sarah Huckabee Sanders attends the 2018 White House Correspondents' Dinner at the Washington Hilton on April 28, 2018, in Washington, D.C.
"And of course, we have Sarah Huckabee Sanders. We are graced with Sarah’s presence tonight. I have to say I’m a little star-struck. I love you as Aunt Lydia in 'The Handmaid’s Tale.' Mike Pence, if you haven’t seen it, you would love it. "I actually really like Sarah. I think she’s very resourceful. Like she burns facts, and then she uses that ash to create a perfect smoky eye. Like maybe she’s born with it, maybe it’s lies. It’s probably lies. "And I’m never really sure what to call Sarah Huckabee Sanders, you know? Is it Sarah Sanders, is it Sarah Huckabee Sanders, is it Cousin Huckabee, is it Auntie Huckabee Sanders? Like, what’s Uncle Tom but for white women who disappoint other white women? Oh, I know. Ann Coulter." In response to the backlash she has received online, Wolf also tweeted, "Why are you guys making this about Sarah’s looks? I said she burns facts and uses the ash to create a *perfect* smoky eye. I complimented her eye makeup and her ingenuity of materials."